1. I left on Thursday and went to Boston. I came back on Sunday. 2. Joe left on Sunday and went to Newfoundland, and comes back today. 3. I leave Saturday, and come back at just about the time that Joe splits to go somewhere else. 4. I will see him again in October, I think. 5. We have got to plan this stuff better. 6. I had a pretty amazing time in Boston. I got to see some friends, teach at The Stitch House Dorchester (You should go. They’re awesome) and the whole weekend went by really quickly, and I kept going to bed really early because I was super tired by the end of the day, and I really love teaching you guys, but man. It’s hard to get a lot of knitting done. 7. I’m sort of on a sock jag. I didn’t mean to be, but when I was leaving I’d just finished that little dress (thanks for loving it, I’m so proud) and I didn’t really have time to get another project going, so I grabbed two skeins of sock yarn and got out of Dodge. It was a good decision I think, I mean, Winter Is Coming and so is Christmas and The Long-Range Planning box is looking a little lean, so the next few heavy travel weeks are a great time to pound out a bunch of pairs. I finished these the last day or two (lost the lable. Sorry.) and there’s another pair on the needles, and I’d forgotten how satisfying it is to have a project that’s done in just a few days. 8. I think I have to start my Rhinebeck sweater. I don’t know what he saw there, but he looked away quickly, tapped madly on the keys, and then said “There. I’ve re-booked you on a flight that leaves in about 40 minutes. It’s a direct. I’ve waived the change fee because of the “weather”. (He actually did air-quotes there.) You’ll be home before you were even supposed to leave.” I looked outside to see if anything had changed, and it hadn’t. The weather was just fine. 10. It is a miracle that I didn’t kiss him on the mouth. You fixed Tuesday to Wednesday before I could comment. Happy Hump Day!! Thank goodness for small miracles and kind airline employees. I have been on that boat more times than I would like to remember going back and forth from New York to Kansas while my husband was stationed there. Although I was not typically as lucky as you were haha. Happy knitting and get some rest. That is an awesome airline employee! I am amazed you didn’t kiss him. So glad you got home a bit earlier than planned. How nice to hear a happy travel story. And although I missed you on the blog, make the most of your time with Jow. And happy knitting. Wow… what airline were you flying? changed your flight and didn’t even charge you??? I fly United and not only do they charge exorbitant change fees, they beat you with a stick. I’m very impressed — we ALL want to kiss him on the mouth!!! and the socks are lovely by the way. I don’t know that I would have kissed the guy in your situation, but having been in something similar long ago, towing a scared 12 year old with me, I would have hugged him (and I hugged my airline person when she managed to get me two seats on a flight that would have got me home long before dinner instead of one that would have gotten me home well after midnight). All those years of travel have finally paid off. Thank goodness for that agent and the “weather”. Aww, what a sweetheart! I’d bet the airline or the terminal has a blog, and wouldn’t it be lovely if they could know what a good deed this gentleman’s done. One of these years I gotta get a Long Range Planning box…the holidays always just sneak up on me! I’d be afraid they would fire him for his good deed! Oh, no, he wouldn’t be fired. This is in no way meant to diminish the lovely thing this man did, and yet what he did also benefits the airline. I’ve had this happen a few times, and I will happily go to the airport early when my business is done on the off chance it will happen again. They had an empty seat on a flight about to depart. By filling it, they then had more flexibility to get someone else onto the later flight if they needed to. It was a win for everybody. That said, I’m sure that this win went to Steph at no charge because he recognized another kind soul. She didn’t demand it, or even ask for it, but she clearly needed it. Kindness begets kindness. Very nicely said! If only more people in the world believe that! So glad you’re home safe and early Steph! I’m sorry you guys have had bad experiences with them. I’ve flown a lot and they are my top favourite by a massive lead. On a flight back from London I got randomly upgraded to a bank of 3 sky couches and could lie flat and sleep. At the end of a mega trip that is the most incredible experience. On more regular small commutes I like ther efficiency and the way they treat you as though you aren’t an idiot or trying to dodge the system Whichever aircarrier treats you as a person most consistently def wins your affection. I hope you’ve found that with another! There are nice people out there! I LOVE the kindness of strangers! I bet if you HADN’T been so tired, you may have had the energy TO kiss him. Just sayin’. To tired. I am so happy for you that you got home early. That happened to me once and it was so lovely. Also, love the socks, very manly. Whoa, super awesome!! A few extra hours at home is always a nice benefit, particularly hearing your crazy travel schedule in the next month!! Good luck with getting the socks out! I’ll be meeting you at Pudding Yarn on Monday, so I can’t wait to see what you bring to knit! Two ships passing…you and Joe. You will both LOVE to see each other when your paths do cross again! Many thanks to the airline employee who got you home early because of the “weather”. Maybe he was a fan? Honestly, this brought tears. People are lovely. How terrific!!!! Yay for generous and kind people! Were you carrying your pointy sticks at the time! LOL! It is so nice when the world pays you back for kindness. Yay, “weather”!!!!!!! That’s just an amazingly nice story. Couldn’t have happened to a better knitter! Love the socks! Click you heels and it will be winter. I am knitting socks llike a mad woman too. 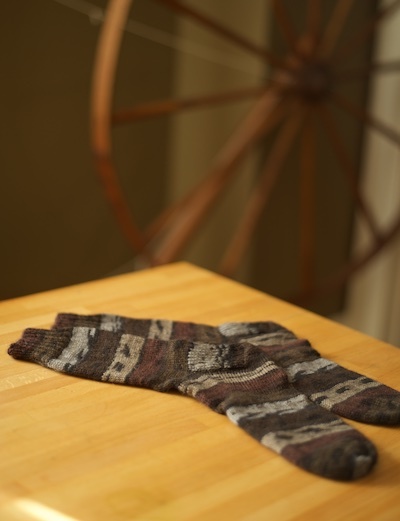 Hubby got me a Canadian Production Wheel and in return, he asked for….wait for it…wait….black socks! Yes he did. Jet black dress socks to wear for church. He is going to get said socks. It is the least I can do to say THANKS for a fiber arts tool made in Canada almost 100 years ago. Go home dear Harlot. Sleeeeepp! Isn’t it great to be touched by kindness? Mine came from a flight attendant who took one look at my sleep-deprived face and gave me a pillow and blanket and a promise to wake me in time to prepare for my connecting flight. Angels come in all walks of life. What a generous gesture. How very, very kind of him. So there really ARE good and considerate and caring people out there. Some days I wonder. Read this to my husband, and he says he would have kissed him on the mouth, too. Woulda been my hero too. I really believe there are more kind people out there than jerks, and stories like that help reinforce that. Thanks for sharing it. That agent deserves a prize – amazing customer service! I probably would have cried. The man deserves handknit socks. That’s so wonderful in a thousand different ways. I love when people take the initiative and do something, jobwise, that can seem so small yet make a world of difference to someone. I’m glad you got home before you were supposed to even leave. I don’t mind a wait if I have my knitting, but I completely understand being tired and wanting to be home. That employee got some good karma points for helping you out! I leave Hobart (Tasmania) tomorrow with my husband and little girl to go to Italy for a conference, and then for 2 weeks of holidays in France to visit the family. It’s such a long trip (about 21 hours) that I hope we get good airline staff on the way there and back. They are usually pretty good, and your story reminded me of that. Some ground staff and flight attendants are just so lovely that they make long hauls go quickly and smoothly. 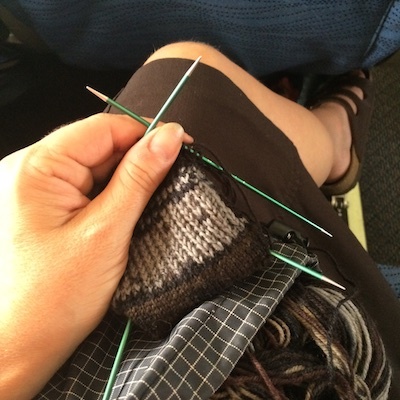 I am packing yarn and needles tonight (and a bit of work to do as well — let’s pretend I WILL work on the plane). The best airport story ever! Thanks for coming to Boston – your workshops were great and it made this Aussie really happy to meet the lady whose blog I have read religiously for 10 years!! Now… To begin mastering lever knitting! Don’t you just love kind airline employees? Oh, that was great and the airline guy was so dear, but you did lose a lot of knitting time. Wait — when did you get a great wheel? I hope you get some rest and at least a snuggle with your honey soon! And speaking of airports, did the lost sock ever find its owner? Really restores your faith in human nature. What a lovely gift you got. You tell the story so well too. What a wonderful airport tale! Glad it happened to such a wonderful and deserving person. I would have probably kissed him. Maybe he needs socks? 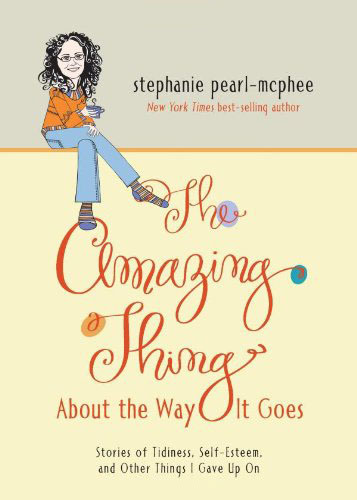 Stephanie, that rebooked flight is one of your “karmic balancing gifts.” You deserved it. I would have kissed him or….gifted him with those lovely just completed socks. It’s 100 days until Christmas! That simultaneously excites me and makes me nervous. What!?! The 100 day countdown already???? Ha, ha….number 10 made me laugh – thank you!! I don’t know why, but that almost made me cry. How awesome! Nice to have a positive surprise when you travel. I was flying the same day through Montreal, arriving at 5:30, and at that time there was ‘weather’, thunder and lightning. We missed our connection by mere minutes and didn’t leave until the next morning. So, he wasn’t lying! Now that’s karmic balancing in action! Good for you! It happens. Yes, there’s good in the world and good people. I need to know your secret, Stephanie!!! I would love to avoid all the waiting time between flights when traveling home! Wow. What airline were you flying? Air Canada? Porter? Please share– I fly between Boston and Toronto a lot. Of course, my experience tends to be that it really depends on the kindness of who’s behind the counter… sounds like you got a really nice one, and I’m so glad you did! My sister-in-law says Porter does that. If you get to the airport early enough to get on an earlier flight they’ll put you on it at no charge. But if you want to switch to a later flight they will charge for that. So glad you had a good time on Boston, Stephanie. It is a lovely city. Air Canada for the win! Air Canada has done that for us, too! One time we had to literally run through the airport to get to the gate as they were boarding. Aw, that is lovely and heartwarming and makes me proud to be a Bostonian. My birthday was that Friday and since 2001 it is a bittersweet day for me. Thanks for the laughter, learning and knitting that evening. PS I’m glad you arrived safely and early. Ya gotta love the good ones. Whenever you have one of these airport/airline stories (there have been some not nearly as happy as this) I always wonder why you are doing all the connecting. It’s a business expense, right? Toronto is a major hub, right? Book the quickest and easiest way and let your accountant figure it out. If it had been me, the Montreal part would not have even been a factor, even if I was paying for it myself. If you’re the business owner, business expenses still come out of your pocket. A sock jag is one of my favorite things. So is “weather” when it speeds up travel. YAY for you! Several years ago, I was traveling and arrived at the gate to find it very crowded. There were 2 gate attendants and one of them was dealing with a very angry man who was angry because the flight was overbooked. After listening to a loud torrent of very bad language, I looked at the woman checking me in and said, ” if you can get me on another flight today, he can have my seat.” Both attendants looked at me like I was an answer to prayer and my lady said, “ok, have a seat and as soon as the flight is boarded, I’ll get you all set up.” Mr. Angry-pants got my seat and once things cleared out, I got 2 lovely hours of knitting time, a bump to first class on a direct flight and a voucher for future travel. Sometimes it pays off big time to be a nice person in a world full of… Well, NOT nice people. I’m glad you found the nice person. Sounds like on your flight, Sharon, you *were* the nice person! Kudos to you. Such a good thing to hear about nice people and those random acts of kindness…what goes round, comes round. I agree that this guy deserves a lot of socks. It’s always so nice to hear positive stories…far too many negative ones. Glad to see the universe is giving back a little kindness! Did you get his name? That is worth a pair of socks! This makes me so incredibly happy! Thank you whoever he is out there! You deserved the break. How ironic that you were in my vicinity while I was in yours…(maritime provinces). Always be nice to the check-in staff! So glad you had a good experience! Oh bless that man! Isn’t it amazing when people are kind just for the sake of being kind? I think a certain airport clerk earned major good karma points! Don’t Bostonians have a reputation of being cold and unfriendly? I’m so glad your experience was otherwise. That is the universe loving you back. Some really wonderful people work in airports. Rare, but there are a few. I hugged a guy who did something like this for me in St. Louis one time. It had been a bad day… it continued to be a bad day, but was over much more quickly because he changed my flight from hours away to 20 minutes from now. I had to run… but I had time for a hug. Bless that man, indeed! My whole month of August was rather busy like what you have been doing (less the plane travel – mine was all by car) and that man should be sainted. So glad you got home that much sooner. I hope the rest of your month goes just as smoothly. I totally would have kissed him on the mouth. Do write a short commendation for him at the Air Canada website! It is always great to run into a real human while being overwhelmed by travel. Yes, a comment is good. Even better is a note to compliment him, sent to a manager, supervisor, etc. You have to get the name of course, but if you send a note it goes to personnel files ans is regarded with great favour by management. A thank you note is always appropriate. I got goosebumps when reading #9 and 10. Sometimes there are wonderful people out there and I tend to believe that there are more such people than we see, a lot more. That man is an angel. Truly. Many many blessings on his head. And YOU deserve some really good karma coming your way, so there you go. HUZZAH! A wait in an airport avoided, great. An airport employee willing to above and beyond, great. A straight flight home & no layovers??? Priceless! Glad you are home safe and sound. ps. not usually a brown person, but love those socks! That a stranger got you and was kind to you is making me tear up – and I just got my make-up on. I’m grateful you zipped home quickly…yeah non-stops! Love the socks. Love it!!! So great to get such an unexpected gift. So glad you got home quickly. What a lovely story and man! I would have at least hugged him, how kind. Also, can someone tell me what sock yarn that is! Must know, thank you. I’d love to know which airline this was because that’s amazing. I’m impressed with your restraint! You Canadians are so restrained. I would have at least kissed him on the cheek. Or preferably, both cheeks. So French! and therefore Canadian. Love that ticket agent! And yes…I would have wanted to kiss him too. How sweet. I’m glad you’re home for a few days anyway. OMG…it’s so nice to finally hear a good story about an airport! I do nice things for people all day long, with rarely a second glance from them. This makes me happy. LOL. Poor guy probably just wanted you out of the airport! Thinks you’re another one of us crazy Canucks. Nothing worse than having to kill time waiting for a plane, especially if you have nothing to do (said no knitter ever). Karmic balance or reaping a kindness that you’ve sown; there are angels amongst us. I agree with the gift of a pair of YH socks if you just happened to get his name… shouldn’t be that difficult to track down. Nicely done! It would be great if you could find out his shoe size and knit him a pair of your fantastic socks!! Yay for awesome booking agents! He deserves much travel karma. And yay for getting home earlier than expected. I hope you had a great rest and were able to fit in more knitting time. OK, this is an awesome story! I’m so glad that kindness is still alive and well in the world. A few years ago I was traveling to Florida for a Buddhist conference. Our San Diego to LA connector got in early.The only counter employee without a long line was the bi-lingual lady who spoke Spanish. So my husband went up to her and asked in his poor schoolboy Spanish if we could please take the earlier flight, leaving in a few minutes. She laughed at his Spanish, but re-booked us. She said the airline likes it if we go early, because the seat is empty and now they have a little time to possibly sell the one on the later flight. We had a lovely flight. I sat next to Linda Johnson, and we got to Florida in time for some extra Jacuzzi time before the conference started. Love it! Julie in San Diego, who is in the beginning day of the San Diego yarn crawl, whoo-hoo. Hooray for wonderful people. May he be blessed for being right there with you. Wow! What a great ending to the story. What a great guy! : ) And I loved the dress, too, by the way, absolutely adorable. Take some time for yourself now. Sometimes you meet an airline person who just rocks their job and your day. Kissing them is sometimes appropriate…because sometimes they save your bacon in ways you didn’t think of until you are standing in the middle of a mess you had no idea was going to happen – but they anticipated. You put “good” out in the world and it came back to you! Just stopping in to say: STANDING ovation to that great agent at the desk. The USA needs more of those (realizing he’s probably Canadian). It is a fine Bostonian tradition to blame the weather for everything. It actually made me smile to read that someone had deployed it in service of Good. I love this blog… and this entry was wonderful. The socks are fantastic, and I think that your travel story is equally as amazing! That airline employee deserves a pair of socks for his miracle working. Thank you for posting about a GOOD airline experience! As the mother of an airline employee (mechanic) I have heard and seen my share of airport horror stories. Some of which were exacerbated, if not entirely caused, by the passenger him/herself. I fly stand-by a lot, and a friendly, sympathetic smile, calm demeanor and reasonable tone of voice get way more accomplished than screaming and yelling. Most gate agents really DO try to get things to go smoothly. Ducking for cover now as the “one time I was flying and…” stories start to fly. This revives my faith in humanity. Cheers to those employees with compassion rather than always having to stick to ‘policy’ as if their lives depended on it. Save your kissing on the mouth for Joe since he gets home today! Yea for Boston. Thanks for coming and teaching us. Please come back next year. I’ll even take you to the airport after the class. Can “we” know the carrier so “we” – your knitteryly fan base – can say THANK YOU!! You probably should have given him a kiss, lol. Okay…so he’s being nominated for Employee of the Decade…or maybe the Century, eh? Clearly he took lessons from Glinda, the Good Witch, and all you had to do was click your heels…ruby slippers or not…What a sweet blessing. This fall weather brings out the socks in us! Best airport story EVER. Agree with comments that you had some good coming back to you. 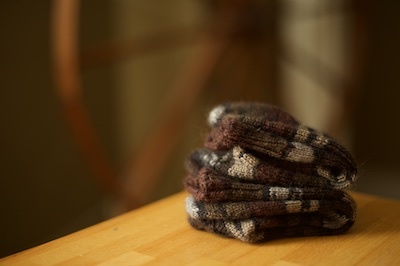 In totally other news, do you have a diesel VW (my husband, of all people, thought you might have mentioned it – never mind, I found the answer here: http://www.yarnharlot.ca/2009/03/where_do_you_wa/) …..and have you read about the recall order? Appealing to you to work up some knitterly outrage, because we all thought we were buying such a Good Car. I’m beyond appalled. Sorry to spam the comments, but I’m trying to reach People. Thank God that humans do work for the airlines. I hope you at least go his shoe size so you can make him some socks! What a wonderful man. I bet someone once knit him a wonderful, wooly baby sweater…. Man, that dude just banked a crap load of good karma. Best airline story I have ever heard. I agree, he deserves a hand knitted thank you. 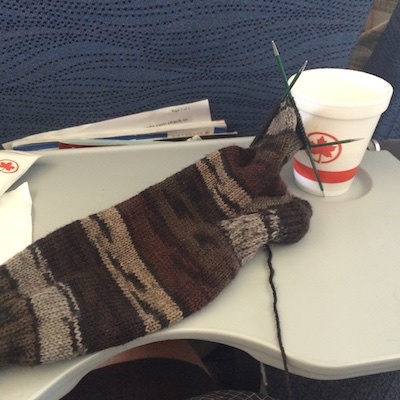 If the socks are problematic, how about a nice toque in Air Canada colors? Definitely suitable for a Boston winter. Lol! I love number 10! People like your airline person really remind me that there are good people in the world. I’m so happy he was able to do that for you. I’m a month late but, again this makes me happy. Only up there in Canada! And I haven’t even been on a flight ANYWHERE since March!